Do you knit or crochet and have a little time to do something inspirational for someone else? If so, the American Heart Association and The Children’s Heart Foundation could use your help. Every year, tens of thousands of babies are born with a congenital heart defect, the most common type of birth defect in the county. 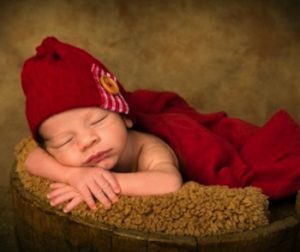 To raise awareness, The American Heart Association and The Children’s Heart Foundation have launched “Little Hats, Big Hearts,” a campaign that aims to don all babies born at participating hospitals with knitted red caps during the month of February. “We believe that health starts from the moment a baby takes its first breath. Through our Little Hats, Big Hearts program, we are empowering moms to live heart-healthy lives and help their children do the same,” said UCLA Health cardiologist Ravi Dave, MD, immediate past president of the American Heart Association Los Angeles County Board of Directors. Though still a couple months away, volunteers are needed now to ensure there are enough hats available when American Heart Month rolls around in February. More than 1,600 newborns in 10 LA County hospitals received little red hats in February of this year, when the program was launched locally. Congenital heart defects affect about 40,000 babies born in the U.S. each year,” says William Foley, Executive Director of The Children’s Heart Foundation, adding that they are proud to be part of a program that brings together the community to rally around families affected by CHD. To participate, go to www.heart.org/littlehatsbighearts for information, including knitting patterns and participating cities, or contact Taylor Tomczyszyn at the American Heart Association’s Los Angeles office at (213) 291-7092. The association is also accepting donations to support the program, including yarn, for those who would like to contribute but do not knit or crochet. Little Hats, Big Hearts began in Chicago in 2014 and has since grown to include 660 hospitals in 40 states, handing out more than 100,000 hats. In addition to using red hats to raise awareness of heart disease and congenital heart defects – the number one killer of Americans – Little Hat, Big Hearts also drives awareness for the American Heart Association’s Support Network, an online forum for families affected by heart disease and stroke.